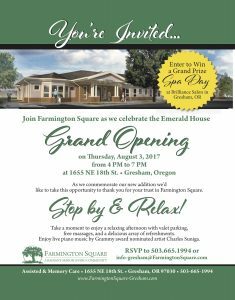 You’re invited to the celebration of the Grand Opening of our new addition to Farmington Square Gresham, Emerald House. Join us on Thursday, August 3rd from 4 PM to 7 PM for refreshments, live music, and free massages! Stop by and take a moment to relax because YOU deserve it! Enjoy catering by Elephant’s Delicatessen, free massages, and live piano music by Grammy nominated artist, Charles Sungia and more. Guests may enter to win a grand prize Spa Day package (worth $300), or several other door prizes. For more information, please contact Betty Aberg: baberg@farmingtonsquare.com /503-665-1994.